Mr. Simranjit Singh Mann is an odd man out not only in the Sikh but the whole the lndian politics. Mann who has had long innings in the jails is a principled man. His politics emanate from his faith. He believes cheap tactics are a sin. Surprisingly he is there where he was 15 years ago but at times emits gloomy notes of passism. He complains the people are not supporting him but in the second breath he says that in politics such occasions do come. Mann won landslide victory in 1989, Parliamentary elections from Taran Taran with a record margin over his opponent. ln those elections security deposits of many Akali Dal (Badal) and Congress (l) candidates were forfeited. Mann was not allowed entry in the Parliament because of his insistence on taking of sword inside. He expected that the Sikhs would support him for the principled stand he stood. But in the elections that followed Mann's party was thoroughly routed. Today he has no representative in the Parliament while in the 117 member Punjab Assembly his party the Akali Dal (Amritsar) has only one seat. While we believe that it is his ideology which has repeatedly been rejected by the Punjabis but this Mann is yet to take home the idea. He says that this type of phenomenon takes place in the politics. 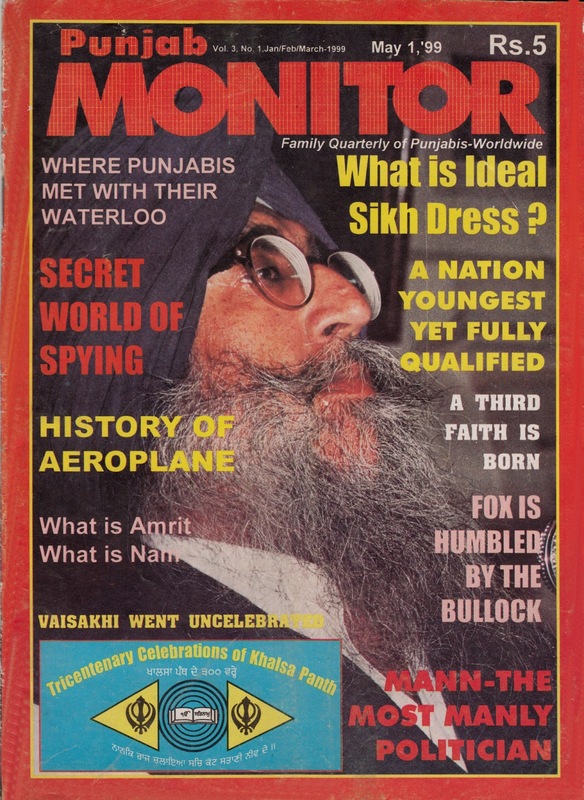 ln 1994 the master manoeuvrer of the Sikh politics Jathedar G.S. Tohra spread a net in which the Mann was also caught and the Amritsar Declaration was signed which Tohra later deserted leaving Mann trapped in the web. Today both Tohra and Barnala shirk from the very mention of Amritsar declaration while Mann takes pride in it. The Mann who does not disown even the militants believes that the Sikhs are not a sovereign power in the lndian system though he himself sticks to the sword and prefers to remain out of the Parliament. What ever his ideology, it appears he is destined to repeat 1989 sometime in the future. This is at least evident from the support he received at his Fill the SYL Canal Morcha'.Today Mann has picked up the thread of Punjab's demands exactly from the point Badal had abandoned it in 1984. lf the Centre did not strengthen Badal's hands, it is quite apparent the next Assembly elections will virtually be contested between two brothers -in-law, Mann and Amrinder of Congress. Q- You say that you observe the Central code, but are you aware that SGPC under the leadership of Mr. Tohra had altered the colour of Nishan Sahib, the Sikh flag.? Mann - No, I have no idea of that, I do not pay attention to small things. Q- Changing of flag, is it a small thing ? Mann - No. It is important, It is our national flag, but I have not deeply probed the issue. Q-Today the meaning of entire concept of Sikhism are being changed to make it a ritualistic dominated religion. Does your party has any thing to counter the disinformation campaign launched by some of the sects ? Mann - Primarily it is the job of SGPC whereas we are a small number; just five members in SGPC. We do keep questioning. Q-Today what a few leaders of Sikh's say becomes a code notwithstanding it may be violating the basic tenets of Sikhism. Your comments? Mann - The Sikhs are lapsing into Brahmanism. Q - Does your party has any programme to correct it ? Mann - We our selves are not observing any rituals, that is all. Q - But who will correct it all ? Mann - A strong leadership can do it, while we are in a hopeless minority. Q-For this you can't blame the masses. That shows how popular the leader is ? Mann - I have tried my best to attract the masses. They respect me a lot. The love me but they don't vote me. Q-Don't you think that the masses don't approve your ideology? Mann - No, there is nothing wrong with the ideology, rather the difference on how to break the shackles of political slavery . Q-In the early eighties there was a high sense of awareness among the Sikhs to which we perhaps could not give any kind of right direction. Have we not failed here? . Q-We are not referring to the militancy. We are talking about sense of belonging which had emerged among the Sikhs in those days ? Mann - Yes, but the militancy was the main propellant of the masses and the militancy could not succeed due to reason I have told to you. The peaceful Protest had no importance in those days. Political decisions were taken on the gun point and not decided politically. Q-So it was crushed pushing the movement back to l0 years 50 years ? Mann - Yes it happens. There are sometimes gains, sometimes losses. See now we have a mandate. Yet Badal Sahib is not prepared to accept the Anandpur Sahib resolution that the Sikhs are a separate nation. In 1947 we were being offered it all but Master Tara Singh and Baldev Singh refused to accept it. So when there is a ripe movement the leadership does't want and when it is not possible they cry for it. Q-Don't you now feel that it is the high time we separate our politics from religion ? Mann - No. we can't do that. See recently there was a debate in the Parliament on the imposition of President's rule in Bihar-which is a Hindu state and you saw the assembly split into two. When it is question of President's rule in the Punjab the whole assembly is united for it. So you can't separate religion from the politics. Q-What is your opinion about the renegade Sikhs or corrupt people who find their entry to SGPC ? Should something be not done to correct it ? Mann - SGPC is a democratic institution. The Sikhs were the first people to tread on the republican path. It is not the fault of SGPC' It is our leadership which is responsible for it. We have failed to lay democratic practices in the working. See Nehru was a leader with a vision, he for example tolerated the voice of dissent and it is on these traditions that the Indian democracy is working. We Sikhs were first to start a democratic institution but our leadership has been illiterate which never valued opposition. Our literate and intellectuals are also to be blamed because they did not offer for the service. Thus the blame lies with the leadership not with the institution. The Sikhs lacked a leader of the vision of Nehru or Jinnah. I would praise Nehru for his tolerance of voice of dissent though was restricted for his own community (nation) as he ruthlessly crushed dissent elsewhere for example Nagas, Sikhs etc. Q-You were last elected as M.P but you did not take oath as you were not allowed to take sword inside. Do you still justify it ? Mann - As you are aware that the Constitution of India provides that carrying of a sword was a fundamental rights of the Sikhs. You have now seen that how they respect their Constitution when it comes to the right of minorities. Yasar Arafat of Palestine Liberation Organisation was allowed to take inside a loaded pistol and address the parliament. A similar question was asked by a prominent Hindu lawyer. I said. "Supposing Khalistan is created and in its Assembly a Hindu is asked to take off his janeo (religious thread) would you then like to go to the Assembly ? The lawyer said he would Sword is not merely a sword, it is our symbol also a symbol of 'sovereignty. See in l97l Bangladash war when Gen. Niazi surrendered, he first laid down his sword and then other arms. Had I laid down the sword then, the Sikhs would have termed me as a traitor of the Panth. Q-What would be your approach when you are elected for Parliament next time ? Mann - l have written to Akal Takhat to know whether I did a wrong thing. Q-supposing if they, don't reply to your query? Mann - Then it is their weakness. The circumstances will tell what I will do next time, By now the attitude of the Hindu is known to everybody. I will see what is to be done. Though the right thing should have been that I am elected again and again and refused entry in the parliament every time. I wish our electorate is that enlightened. lt is important so that the world knows how we are being discriminated. See the American presidents have been shot dead, in spite of this the Govt. has not banned arms since it is the fundamental right of the Americans. Q-About the Tercentenary celebration. What do you feel how it should be ? Mann - I do not believe in constructing monuments and taking out processions. Guru sahib has created Khalsa to rule. "Raj bina nahin dharam chalen hai." (A religion can't survive without a State) Guru ji had said. So you can't fix some goal other than how to gain sovereignty. Q- How do you celebrate the occasion then? Mann - We have asked the leaders to adopt one programme at least. If you are not prepared for the heavy dose, something minimum should be adopted. The 1973 Anandpur Resolution, Sikhs are a separate nation, 1986 resolution for the sovereignty, the 1994 Amritsar resolution. Q-What is Moga conference resolution, Badal Sahib often refers to? Mann - Akali Dal was launched to work for the preservation of the separate identity of the Sikhs, But in the Moga conference Badal sahib is talking about Punjabiat and has sidelined the Sikh cause. Q- Coming to Udham Singh Nagar- Have you Akalis not befooled Punjabis to divert their attention from the real issues of Punjab? Mann - We have agitated for the protection of interest of our Punjabis who would have otherwise been uprooted. There is the land ceiling in the Uttranchal state to be formed with the limit of only two and half acres while our brethren have farms of 100 acres or more, I am still hopeful that the Govt. will not ignore our opposition and not ruin the Punjabis there. Q- Who of the two Jathedars of the Akal Takhat do you accept ? Mann - We do not accept Giani Puran Singh as Jathedar though we have a high regards for him. He has been appointed by Badal and other concerned parties and institutions were not consulted. He can't be true Jathedar of the entire Panth. Q- Don't you consider that SGPC alone is the representative body of the Sikhs. Mann - Yes, SGPC is the parliament of the Sikhs but in the appointment of Akal Takhat Jathedar other institutions and parties are also consulted. Q- Don't you feel that Bhai Ranjit Singh was rather over aggressive (Mann parried the querry). Q- Do you justify summons to Baljindef Singh Hamdard editor Daily Ajit ? 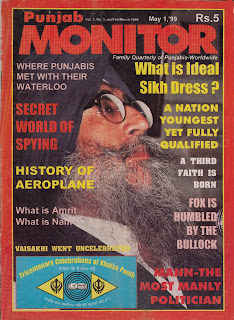 Mann - the Akal Takhat Jathedar can seek the explanation of any Sikh. Summoning does not mean that one is definitely going to be punished. Q-So you don't approve Tohra's removal? Mann - Yes they should have waited at least till April 15. Q- Would you yourself not go to Nirankaris and Radha Soamis to seek their votes ? Q- Which of the two do you consider better -the Congress rule or the Badal's rule. Mann - I don't find much difference between Badal or Congress. Q- Would you not give credit to Badal that there are lass false encounters ? Mann - There were few in the rule of Bhathal as well. Badal's regime has also liquidated Sikhs. For example Kashmir Singh Pandori was killed by the Badals police. Our youth is rotting in jails. See the TADA detenue are more than 1000 and nothing has been done for them Pensions to the aged are not being released. The conductors do not allow free travel to the elderly ladies. Badal Govt. has given a crushing blow in increasing the octroi Rates of electricity have been increased. Our education is utterly ignored, thus the precious careers of children are being spoiled. Q- Would you like to say something about Kashmir problem? Mann - Kashmiris are being massacred. It needs to be stopped immediately and the plebiscite promised by the Indian Govt. should be conducted asking the people's choice. Q- Should there also be plebiscite in Pak occupied Kashmir as well ? Mann - Yes, there should be if the Kashmiris demand it. I want to tell you this Govt. is very cruel. Mr. Jagmohan the ex-Governor has written in his book that had Mann not marched on to Kashmir he would have settled the problem. That shows he had plans for the massacre of the Kashmiris. No doubt, Mann is a nice person.